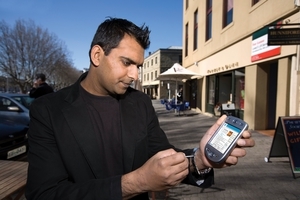 CSIRO and Verdant Health Pty Ltd have developed the Weight Management Mentor, a consumer mentoring and support system that uses mobile phone technology to record a person’s weight management and lifestyle experiences in real time. The technology polls the participant at key times, requesting information on diet, activity and other lifestyle and well-being indicators. This new technology has a significant advantage over other methods of recording data, including the consumer needing to recall and note data at the end of every day. Photographer : David McClenaghan on September 04 2008.